I really liked this book because it was filled with adventure and excitement. It really kept me in suspense wondering what would happen next. 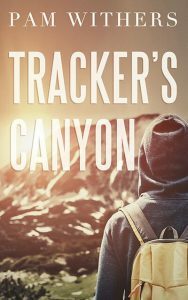 I could make quite a few connections with this book because of the main character’s love for the outdoors. It talked a lot about climbing and tracking in the wilderness which I like as well. My favourite character is Tristan because he enjoys outdoor activities like climbing and tracking. I felt like I related to this character in certain scenarios, especially when he was biking and mud splattered up his back just like it does whenever I bike to school. One of my favourite parts in Tracker’s Canyon is when Tristan was climbing down a waterfall and his guide pulled him into the waterfall trying to drown him. In this part I was worried about Tristan surviving and excited to see what would happen next. This book is a good choice for anyone who likes adventure and excitement because it contains action-packed adventure. I would say that this book is intended for young adults. Review by Brennen, age 13, grade 8.